We were recently contacted by a university Safety Officer (SO). A researcher using our Model SFA Stereo Microscope Fluorescence Adapter with Royal Blue excitation thought that the light source might also be emitting hazardous shortwave ultraviolet radiation. Properly concerned for general lab safety he stopped using the system until he could confirm that there was no UV hazard. Our immediate reaction was 'Of course that's not possible! ', but we take any safety concerns very seriously and worked with the SO to find a way to clearly confirm our belief. The whole process was instructive and we wanted to share it here. We'll tell you why the researcher thought that there might be UV present, and what we did to confirm that there was not. "Detection typically involves a gel containing nucleic acids placed on or under a UV lamp. Since ultraviolet light is harmful to eyes and skin, gels stained with ethidium bromide are usually viewed indirectly using an enclosed camera, with the fluorescent images recorded as photographs. Where direct viewing is needed, the viewer's eyes and exposed skin should be protected." There is also literature, both scientific and from manufacturers, that describes the use of these short wavelengths for EtBr fluorescence. Based on this information, it is easy to understand why one would have a strong association between ultraviolet and EtBr fluorescence. With this mindset the researcher was absolutely correct to be concerned when he saw fluorescence under our blue light source. There is a lot of additional support for this. 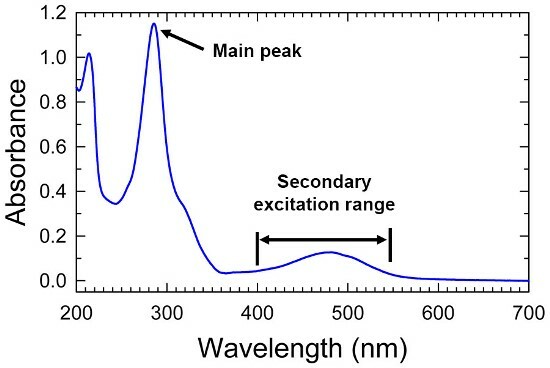 If you search the internet for "ethidium bromide excitation emission" you will find many links to tabulations of excitation and emission peaks for a variety of fluorophores. Wavelengths recommended for EtBr excitation in these tables include 493, 510, 518, 524, and 545nm! In addition, there are companies that sell blue-light transilluminators that can be used for EtBr. Working collaboratively with the university SO we demonstrated to the researcher's satisfaction that there was no dangerous UV radiation emitted by the Royal Blue light head. This was a valuable exercise in tying together underlying information about technology (LEDs), data on excitation spectra ranges, and simple, practical tests to understand why a phenomenon was happening.